Xifaxan is a highly effective antibiotic used to cure intestinal infectious diseases. It works differently from other antibiotics because it passes through the stomach cells directly to the cells of the intestines eschewing absorption in the bloodstream. According to the resolution provided by the US Food and Drug Administration, the administration of Xifaxan for liver treatment is approved. The drug is certified for prescription in patients with advanced liver disease since it makes it possible to significantly reduce the risk of hepatic encephalopathy. Hepatic encephalopathy is a complex of symptoms associated with abnormal liver functions of varying severity (from mild to severe symptoms, including even hepatic coma) that develop because of acute or chronic damage to the hepatocytes. One of the most essential and, simultaneously, well-studied factors in the development of hepatic encephalopathy is a rapid increase in the level of ammonia in the blood. Xifaxan helps to normalize the level of ammonia, minimizing the negative effects. The medicinal product inhibits DNA-dependent RNA polymerase of bacterial cells and causes their death. The wide antibacterial spectrum of the drug contributes to the suppression of pathogenic intestinal bacterial flora, which causes a number of pathological conditions. It also reduces the formation of ammonia and other toxic compounds by bacteria. The efficacy of the Xifaxan bacterial coverage has been evaluated during several clinical trials conducted in the USA, Canada, and Russia. It has been proven that patients taking Xifaxan are less likely to develop hepatic encephalopathy than those who received placebo. The drug is a broad-spectrum antibiotic. It belongs to the group of semi-synthetic derivatives of Rifamycin. The medication works by irreversibly binding the beta subunits of the DNA-dependent RNA polymerase, and therefore inhibiting the synthesis of bacterial RNA and proteins. The pharmaceutical preparation has an impressive spectrum of antimicrobial activity, including the majority of gram-negative and gram-positive bacteria, as well as most aerobic and anaerobic microorganisms that cause gastrointestinal infections. This drug is distinguished primarily by its low absorption rate in the stomach. Thanks to this essential factor, the medication creates a high concentration of its active ingredient in the lumen of the intestine. The medication is not regarded as habit-forming. 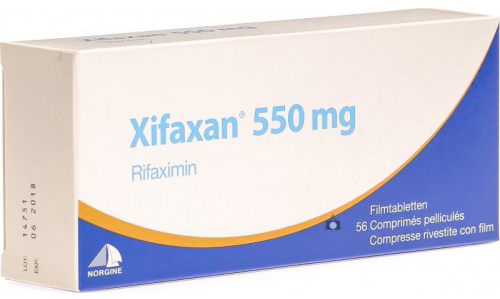 Hence, those patients who wonder is Xifaxan a narcotic should not worry about its accumulative effect: according to the clinical experience, the drug does not cause any noticeable withdrawal symptoms even after rapid discontinuation of the therapy. The medication is also used to treat small intestinal bacterial overgrowth (SIBO). The administration of Xifaxan for SIBO allows preventing the development of serious adverse reactions in the vast majority of cases. The drug is taken orally. Children over 12 years old and adults should take 200 mg of the medication every eight hours or 400 mg every 8-12 hours. The appropriate doses, as well as the therapeutic regimen, may be adjusted by a doctor. The duration of the therapy should not exceed one week. In general, it is determined by the condition of the patient. Repeated treatment should be prescribed no earlier than in 20-40 days. Almost all patients confirm the high effectiveness of the drug in the treatment of intestinal infections. However, some of them note that they achieved a noticeable effect only after the daily dose has been increased up to 1800 mg.